The giant LOFAR radio telescope network will be used, among other things, to take a close look at giant black holes like the one at the heart of active galaxy Cygnus A (shown here), which is about 700 million light-years from Earth. 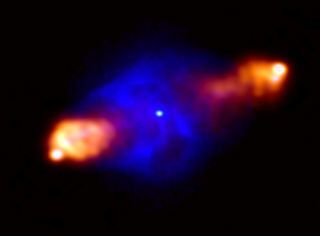 This image from LOFAR shows plasma jets from the black hole that stretch 2,000 light-years from the core of Cygnus A. More than 20,000 radio antennas will soon connect over the Internet to scan largely unexplored radio frequencies, hunting for the first stars and galaxies and potentially signals of extraterrestrial intelligence. The Low Frequency Array (LOFAR) will consist of banks of antennas in 48 stations in the Netherlands and elsewhere in Europe, all hooked up by fiber optic cables. Signals from these stations will be combined using a supercomputer, transforming the array into "perhaps the most complex and versatile radio telescope ever attempted," said Heino Falcke, chairman of the board for the International LOFAR Telescope. Currently 16,000 of LOFAR's antennas and 41 of its stations are up, and the array will be completed by the middle of this year. All told, LOFAR will have a resolution equivalent to a telescope 620 miles (1,000 kilometers) in diameter. In addition, "it's an expandable design — we can always come along later and add additional stations," said Michael Wise at ASTRON, the Netherlands Institute for Radio Astronomy. Since LOFAR is so large, it can scan large parts of the heavens — its first all-sky survey, which started Jan. 9, can sweep across "the entire northern sky twice in just 45 days," said George Heald of ASTRON. LOFAR is also very fast, capable of measuring events only five-billionths of a second long. In addition, the fact that LOFAR is essentially many different radio telescopes knit together means it can run, say, three different science projects simultaneously, Wise said. "This is a pivotal phase in the early evolution of the universe, stretching from 400 million to 800 million years after the Big Bang," said Ger de Bruyn of ASTRON. "We'd like to know when exactly it happened, how it happened, how fast it happened." LOFAR will also scan for artificial radio emissions as part of the search for extraterrestrial intelligence (SETI). Past SETI missions focused on higher frequency radio waves, but perhaps alien civilizations preferred lower frequencies. "LOFAR can do interesting SETI experiments," Falcke told SPACE.com. "In the next couple of years, we'll be trying it." Low-frequency radio waves are also emitted around intensely powerful cosmic objects such as black holes, and investigating these could help scientists better understand the inner workings of these ferocious systems. For instance, when it comes to pulsars — the highly magnetized and rapidly rotating neutron stars that can form after supernovas — LOFAR can monitor radio emissions from within about 60 miles (100 kilometers) of the pulsar's surface, said Jason Hessels of ASTRON. LOFAR will open its capabilities to astronomers internationally starting in May. Scientists at LOFAR detailed their work earlier this month at the 219th annual meeting of the American Astronomical Society in Austin, Texas.